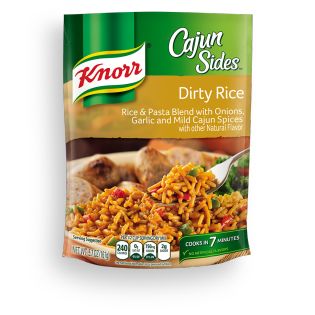 Rice and orzo get a Cajun kick from peppers, onions, garlic and Creole seasonings in our Dirty Rice Cajun Sides. Serve it as a side or bring its smoky flavor to popular recipes like Cajun Sausage Gumbo. Dirty Rice is rated 5.0 out of 5 by 5. Rated 5 out of 5 by Scgobbler from New backpacking favorite Great for a quick weekend backpacking trip when paired with smoked sausage. Freeze the sausage so it lasts a little longer! Rated 5 out of 5 by PAMI from perfect ........ perfect under my seafood gumbo!!! it's one of the few things that I make that everyone in the house loves!!! !